Thanksgiving is coming up next week, and busy December is getting closer! 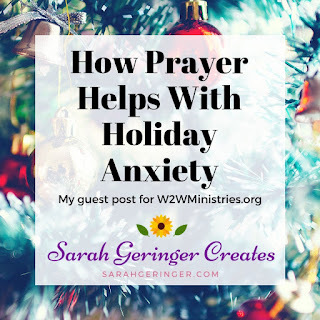 Do you feel anxious in any way about the upcoming holiday season? I deal with holiday anxiety almost every year. Prayer is essential for replacing anxiety with peace. If you deal with any holiday anxiety, whether it's about getting everything accomplished, relationship problems, or feeling left out, prayer can help you too. These are the verses I use when praying about anxiety. Prayer: Lord, thank you that you care about all my little anxieties. Help me trust you today. Give me strength and courage to face my fears. Prayer: Lord, you know that I am fearful about what tomorrow may bring. Help me to be concerned only with what is needful for today. Help me to trust you with everything else. Prayer: Lord, I don't want to rush around and miss the main point of Thanksgiving and Christmas. I need your wisdom to set priorities and follow them. Remind me to put you first so everything else falls into place. Using God's word as the basis for prayer will help you find peace this holiday season. Do you see now how easy it is to turn a scripture into a prayer? I hope this post inspires you to take time to dig into God's Word in this busy season and turn scriptures into prayers that will bring you greater peace. 1. What's your favorite scripture? How can you turn it into a prayer? 2. What is your worst source of holiday anxiety? How can prayer help you through it this year?